You are right--in the end, each person needs to do what is right for her/her cat(s). I have never tried this line of food. It looks like something I could rotate in at times, though, so I may check some out. we love seeing the pic-a-nic. Thank you for this post - it's very informative, both for me and my kitties. I've had digestive/auto-immune issues for a while now. I've been told to avoid gluten and a couple other things, but I had no idea about carrageenan! I'm going to keep an eye out for it and keep it out my and the furkids' food supply. yes this is an informative post. will start looking more carefully on the food that my kitties eat. Thanks for this review. The Merrick canned food isn't yet available here but the dry has finally made it to our shores. 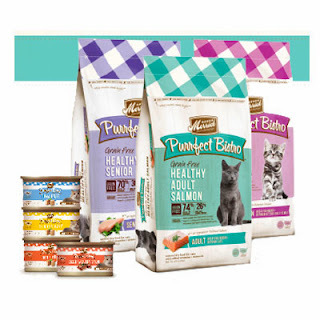 The options for pet food without carrageenan (over here) are very limited. Love the pics of your kitties at the "Bistro"!!! I love chunky foods, and my human hates giving them to me, since my digestive system is a little rocky to begin with, but sometimes it is the only thing I will eat! The mom just ordered us some of this food...but now she's having second thoughts about it since reading your post because she doesn't like carrageenan either. Guess we can eat it occasionally. Well that was some darn good info, but the picnic was way cute! We are currently eating canned food with carrageenan because it has been such a trial to get us eating anything but kibble. The plan is to get us onto food without it once we're eating this more readily. So frustrating that they're using it unnecessarily like that! That picnic is so cute! Love it... great review as well. Love the tea party photos! I feel the same "paranoia" you do about pet food ingredients.